If you don’t like working on a boat, just forget about cruising. A boat is a never ending project. Always something to do. Here are some upgrades for this year’s cruise – some for safety, some for comfort, and some for fun. The galley in Motu Iti is petite, a charitable word. It’s about the size of the Playskool kitchen my daughter had when she was five. 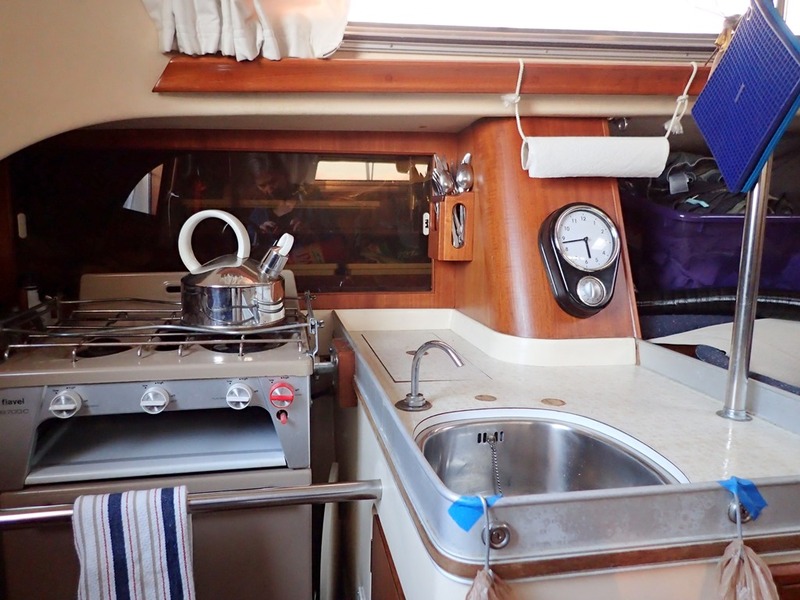 When I cooked, Goldwin was banished to the other end of the boat so I could roam practically the entire galley and salon area in search of food and cooking utensils. Now, I have two large, convenient drawers, beautifully crafted by Goldwin, and they hold a lot. They were installed in the area of the original fridge – that never worked and lacked any insulation. Now they hold the utensils that I used to keep in an aft locker of the main salon, all jumbled up in a big plastic basket. We also increased our usable counter space by removing the pressure water faucet, which had two rather large handles (one for hot and one for cold even though we never, ever had pressure hot water). Now we just have one slim faucet for our tank water. It works with a foot pump – sort of like those fancy no-hands kitchen faucets, except you use your foot. See all the space I now have for food preparation? Comparatively speaking, of course. Our fridge is a Waeco unit, like the ones they put into mini-vans. It runs on 12-volts and used to sit at an angle underneath the chart table. You bent down, lifted the lid, and all the food slid down to one end. You had to find the food by feel because you really couldn’t see anything. Now the fridge is on what was the aft quarter berth. This improvement puts the fridge on a flat surface and up at almost counter height. I re-did the cushion. 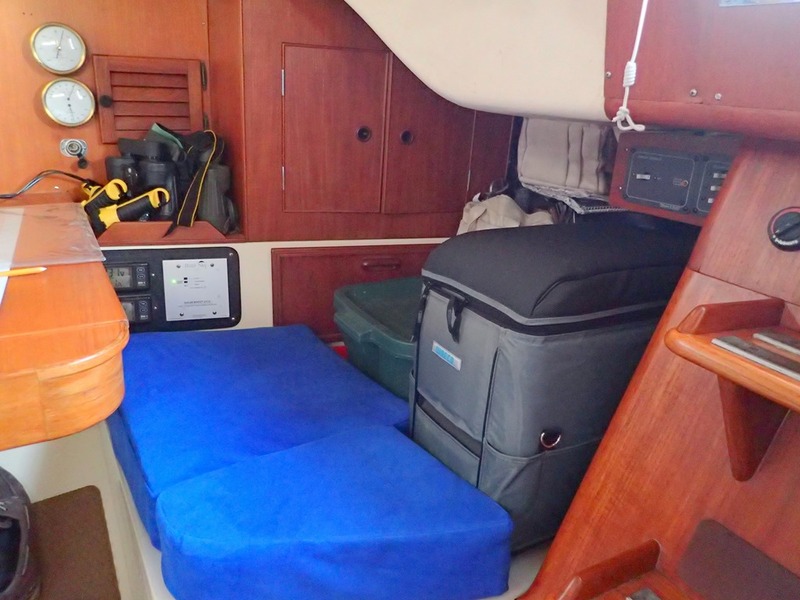 It’s now a seat cushion, not an entire berth cushion, so Goldwin’s tools fit more easily in the space that was the quarter berth. The new cushion is really two cushions joined by velcro. I pull off the little cushion and lift it out so I can pull the fridge out for easy access. So much better. Here’s the biggie: a rub rail. 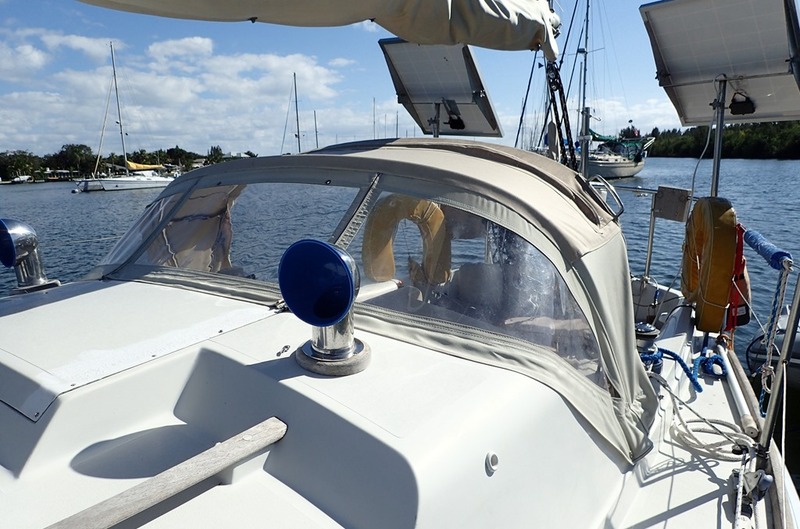 This is like a bumper on a car, only on the sides instead of front and back – it protects the side of the boat when you are at a dock (or run into something – oops). It’s also a splash rail that throws spray off to the side (not on you). It’s made out of extruded PVC (won’t rot), with a stainless steel cap and is through-bolted. 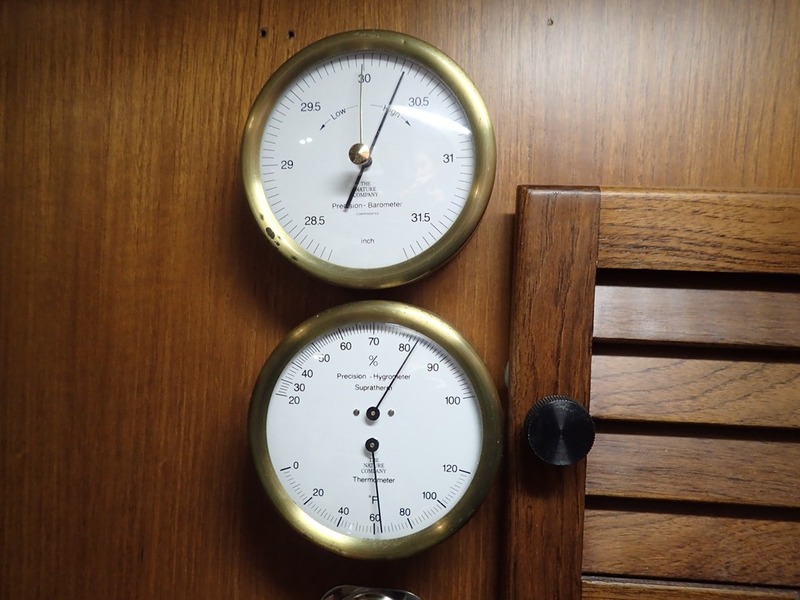 (The through-bolting was accomplished when most of the interior wood was out of the boat being varnished (satin with semi-gloss on the handrails) – another upgrade.) The rub rail sticks out about 2 3/4 inches from the side of the boat. 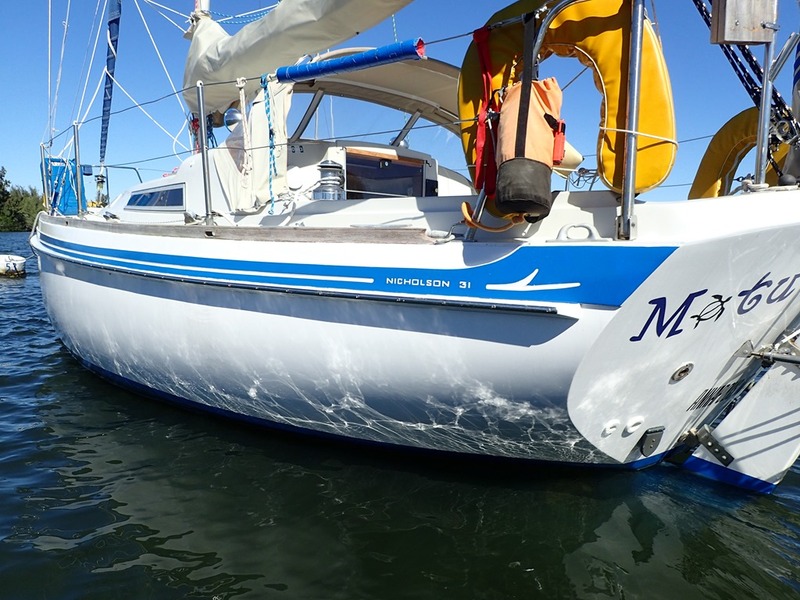 Our daughter suggested its placement – from a little ways back, it almost disappears into the side of the boat (so as not to interfere with the boat’s natural beauty). 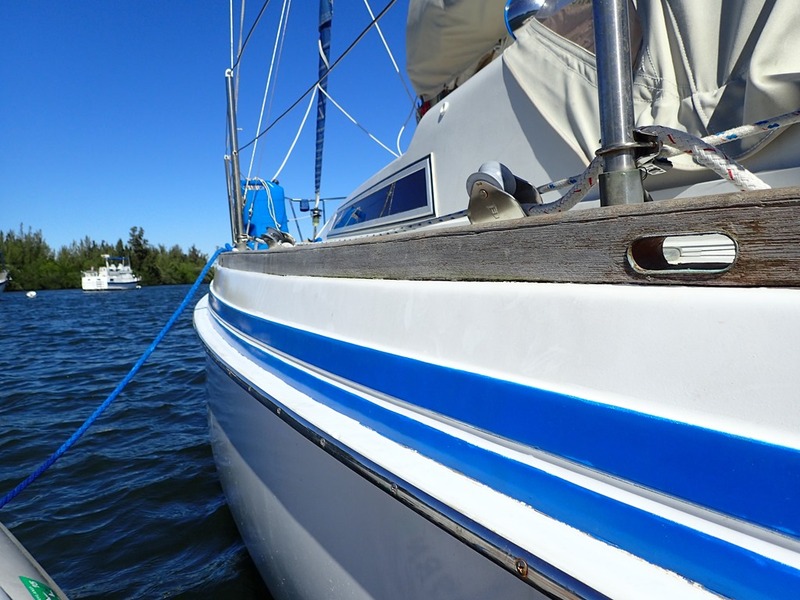 The rub rail also makes a nice step for getting on and off the dinghy. Our dodger was in serious need of repair – badly faded, torn in some places and marginally waterproof. Instead of a new dodger, we reinforced the one we had. FIrst, we made the bows rigid by adding horizontal support tubes/turnbuckles. We also added stainless steel handles on each side. Then we re-stitched parts of it, mostly the top and trailing edge, replacing fabric and adding fabric, including new trim fabric. And I had to design openings for the new handles. It was probably the most frustrating and difficult sewing I have ever undertaken. For one thing, it took both of us to support it as I sewed along since the whole front part is made up of plastic windows that won’t roll up to fit under my sewing machine’s arm. But it turned out fine. At least it hasn’t fallen apart so far. Now for the fun stuff: Goldwin installed two weather instruments near the nav station. 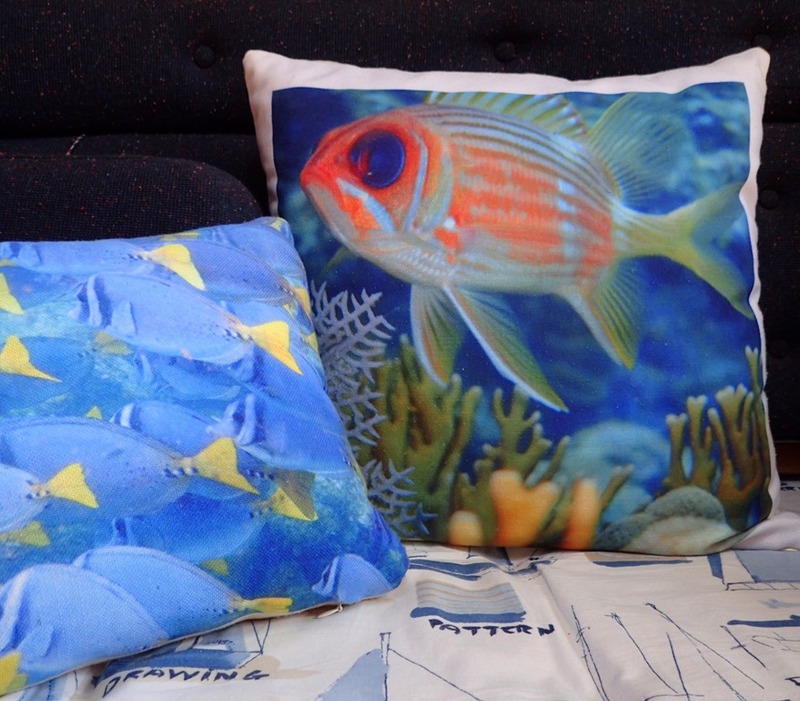 And we have new pillows, made from our photos. Here are my favorite fish pictures – the one of the big-eyed orange guy was taken at Thunderball cave in the Exumas – and my yellow-tail fish are from a snorkeling trip in the Galapagos. 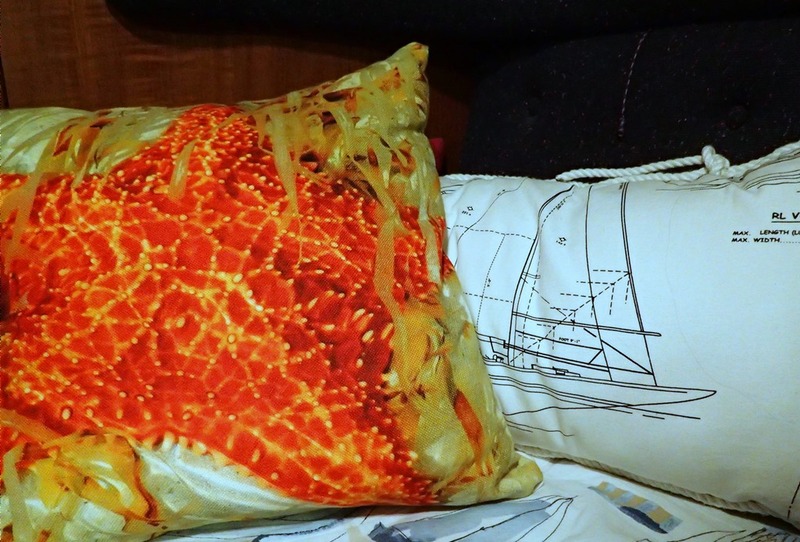 The brilliant starfish picture was taken at Tahiti Beach in the Abacos; and the other pillow is made from nautical fabric I liked. I used a couple of these pillows in my office last year, but they were always intended for the boat. Whenever I looked at them, I thought of Motu Iti – nice. 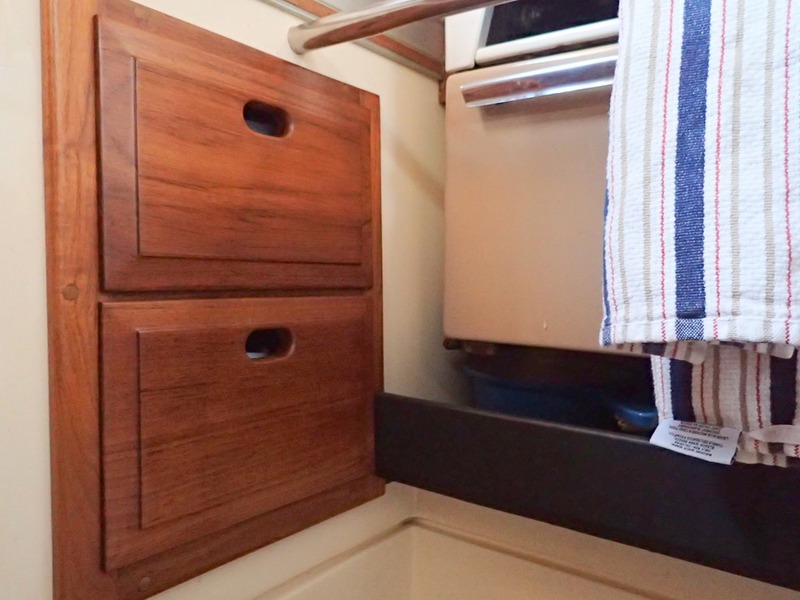 For more about making a boat a home, see: https://sailmotuiti.com/2013/03/01/making-a-boat-a-home/ and http://velocir.com/2013/02/03/im-on-a-boatcreating-a-cozy-boat-home/ . Thanks for all of your posts, but this last was way cool. I’m so interested in the Waeco cooler that you showed. How long have you owned it, and are you still happy with it? How many amps does it draw when running, and how often does it run? It looks like you have a fabric cover. Is the cover insulated? Is it a Waeco product, or aftermarket? Thanks for reading our blog. The Waeco is a CF-25; we got it new on eBay in 2012 and still like it a lot. This past year we bought an insulated cover for it -you have to unzip the whole top to get into it, but the cover makes it more efficient. The Waeco draws 5 amps when it runs – about 30% of the time. It we ever needed to replace it we might get an Engel – better compressor; more efficient; but pricey. So pleased to be able to watch you enter “true” retirement in such a beautiful way. Your photos are wonderful. Tell me about your photo to fabric transfer. I have friends snorkeling in VI (and sharing some great underwater pics) who, I believe, would love this. Thanks for being my “armchair tour” of warm and sunny!